Inhabited by that innate, unexplainably strong desire to roam and impetus to go wandering? Does your traveling culminate in booking packages and tours? Or are you into exploring per pedes? No matter where I have roamed on this earthround, exploring cities and nature by foot has always been the most rewarding way to really engage with your surrounding. 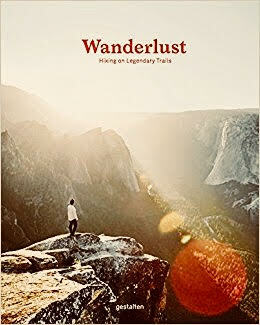 Wanderlust illustrates and describes the merits of both the world’s most renowned walking trails but also sheds light on hidden gems that might make it on your bucket list. This opulently illustrated coffee table book depicts the routes, outlines maps and an effort is made to not merely focus on one part of the world – no matter if it is pilgrimages in Japan (i.e. Kumano Kodo, the series of routes zig-zagging one of the largest islands of Japan), Spain (the classic King’s Little Pathway, i.e. Caminito del Rey, one of the world’s most dangerous) or up North in the neither region of majestic Norway covering all kinds of terrain running the gamut from nice via deserts to lush forests from below sea level to lofty heights. The accompanying essays shed light on the trecks, with first-hand experiences being shared and advice being dished out both for the seasoned trekker as well as the novice. Wanderlust is enjoyable on different levels as apart from serving as a hands-on guide, Wanderlust can also just be a nice form of escapism to delve into when you are over your current surroundings and a source of inspiration for taking on future challenges. Picturesque, diverse, a good ratio of text to photos, factual as well as historical and seasonal contextualization – a must-have for any passionate globetrotter.